YOUR DONATIONS HELP US SAVE LIVES! Why your donations are so important to Sparkle Cat Rescue. You are helping us save lives! In 2017, Sparkle Cat Rescue paid $47,885.88 in vet/medical expenses for cats in our program! Your donations helped us provide medical care to the cats and kittens we rescued. The $47k does not cover the additional costs of food, litter and other supplies the cats in our program require. In 2017, we had 5 cats that required more than standard vet care: Logan, Tina, Rudy, Joy, and Tia. Since Sparkle Cat Rescue formed on November 6, 2014, we have rescued 470 cats and kittens in our community. In 2017 alone, Sparkle Cat Rescue took in 115 cats and kittens. In 2017 we approved 121 adoptions. Notable rescues this year: January 28, 2017 we rescued 14 cats at one property where the cats had been abandoned. In July/August, 2017 we rescued 25 kittens from one property in Liberty where our volunteers were working to TNR (trap-neuter-release) adult cats to cut down on the overpopulation of cats. Thanks to fosters and donations we were able to take the kittens into our program. Spay/Neuters Surgeries of cats in our program: 44 spays and 46 neuters. There are 21 future spay/neuters for 2018 of kittens (active or adopted) that were too young to be spayed/neutered in 2017. 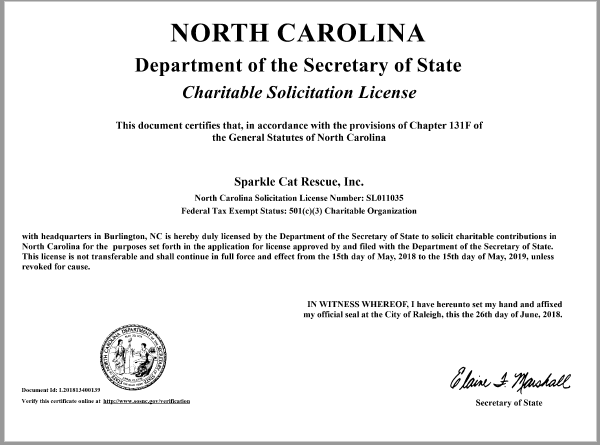 Sparkle Cat Rescue is an all-volunteer (zero paid employees), 501 (c) (3) nonprofit and your donations are tax-deductible. Please consider making a year-end donation to help us in 2018. Your donations are tax-deductible. Please ask for a receipt if you need one for your taxes. Help Us Save More Lives. Please Donate Today. Each cat we rescue receives a second chance at a new life. This means no time limit on how long they stay, medical conditions receive ongoing and necessary care, and unsocialized cats receive love, patience and understanding. Often we do not know the conditions affecting cats before we rescue them. This is the exact reason why we formed Sparkle Cat Rescue. This is also the reason why we need regular donations, so we can keep rescuing and educating the public. If you find it in your heart, we ask if you can make a $10.00 donation, or better yet, make a monthly recurring $10.00 donation. 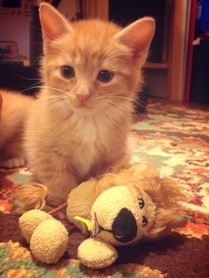 Your donation goes to rescuing kittens like these, vetting them and finding them forever homes as well as educating the public to avoid cases like this one. Augustina (tortie/calico) was rescued from a well-managed feral colony in October. She was due to be released back to the colony when there were no other options for her to be placed and socialized. 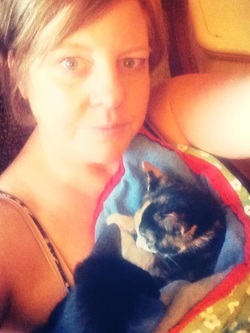 Sparkle Cat Rescue stepped in, took Augustina in and gave her the TLC she so needed. Her buddy Ariel helped too! Ariel was rescued after being found in another managed feral colony, apparently dumped there the day she was found. She was immediately placed with Sparkle Cat Rescue and was adopted by a wonderful family in October 2014. Augustina was adopted along with her brother Sebastian in February 2015. We get regular updates on her and her brother! Pictured: Timmy was rescued from a dumpster in 1996 when he was a baby. He lived to be 16 years old.His mom and dad are the founders of Sparkle Cat Rescue.This photo was taken during his last month when he got to go out and smell grass and be with nature, knowing he didn't have much longer to live.He had been an indoor/outdoor kitty most of his life so it was very important to his family that he be out in the fresh air he so loved.Timmy passed away in April 2012 after a long life filled with love. We are 100% volunteer and donations are applied to the kitties we rescue (spay/neuter, combo testing for feline leukemia/AIDS, FVRCP vaccinations, rabies vaccination), food, litter and necessary supplies. Every unvaccinated, unaltered kitten/cat can cost anywhere from $175-$250.00 and up, depending on their medical needs. If a cat has been spayed/neutered prior to our rescuing them, the cost can be from $100-$200 or more, depending on their health. Add in upper respiratory issues, UTI, or other health issues common with cats and we can incur some major expenses for our sweet fur babies. The Sparkle kitties remain in foster homes (5 homes currently with 15 cats and kittens total). Adoption applications are submitted and applicants are carefully screened for the best home possible for the felines in our care. We hold adoption fairs at least once a month at Pet Supermarket, Nature's Emporium, and special venues as we are invited to participate. We are grateful for your support and love!